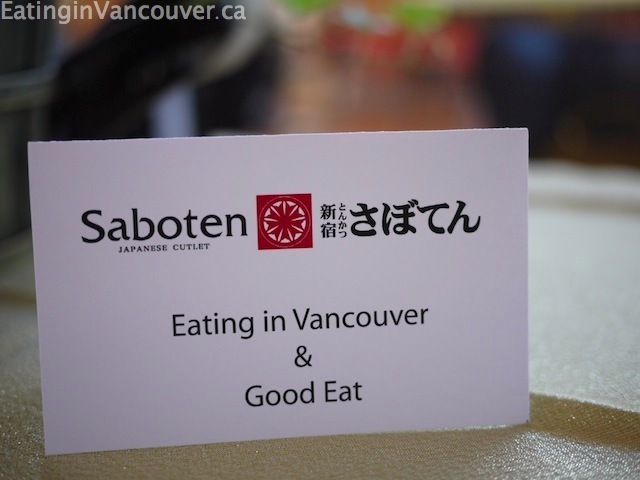 Fairchild Restaurant Group invited Eating in Vancouver to attend their grand opening/media tasting event for Saboten Japanese Tonkatsu this past weekend at Richmond’s Aberdeen Centre. 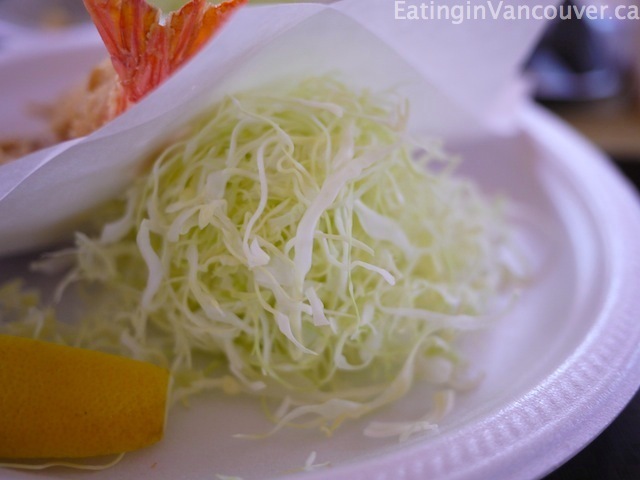 Saboten was founded in 1966 in the neighbourhood of Shinjuku in Tokyo. The name Saboten or “cactus” in Japanese was selected to represent the founder’s vision, which is to build a shop that will thrive with vitality even in the harshest conditions. 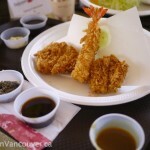 With dedication to serve the best Tonkatsu, Saboten has flourished into one of the largest Tonkatsu chains with over 500 shop in Japan, Korea, Taiwan, Singapore, Thailand, Hong Kong and now Canada. 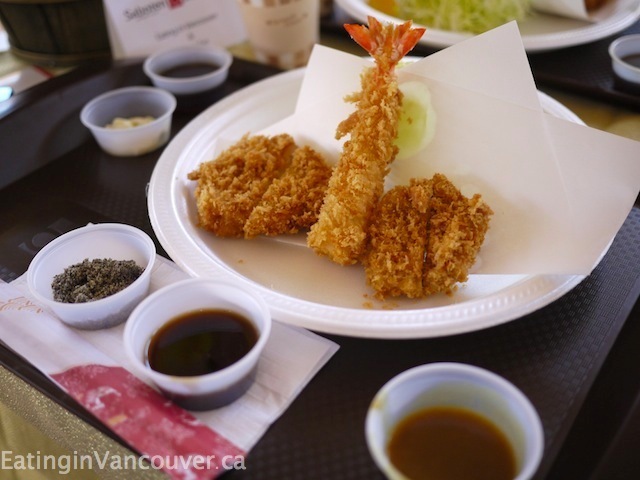 We sampled three different types of tonkatsu: Pictured above from left to right is the Pork Loin, Shrimp, and Pork Tenderloin. 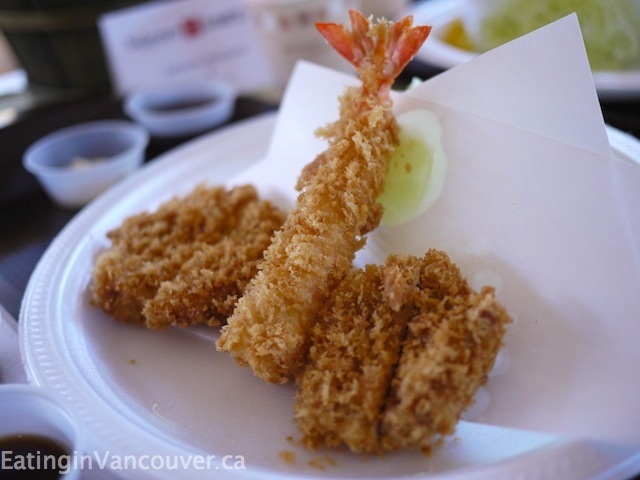 The shrimp was large and crunchy, while the pork tonkatsu was extra crispy on the outside and moist and juicy in the inside. 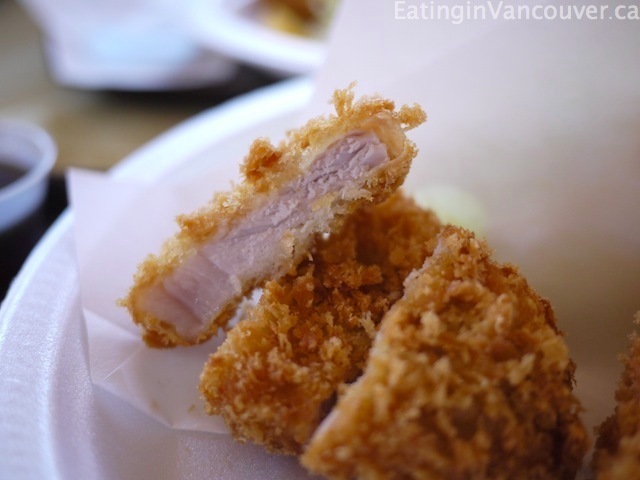 Saboten only uses premium pork (sourced from Alberta) lightly coated with bread crumbs made from their house-made bread to ensure the juice of the cutlet is preserved. 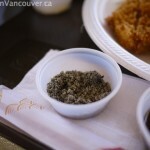 None of the tonkatsus were greasy and all had just the right amount of batter. The pork tenderloin was, not surprisingly, incredibly tender, and we preferred this leaner cut to the regular fattier loin. 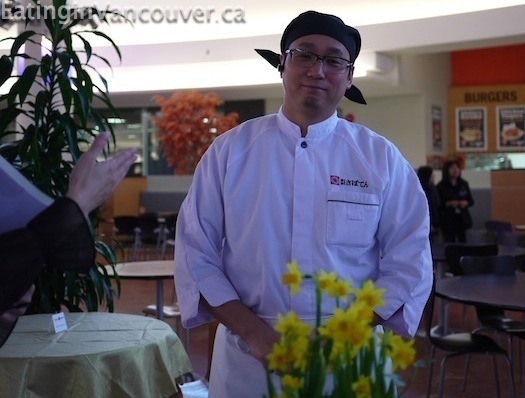 A Japanese team came to test and source ingredients to ensure they met the company’s rigorous standards. 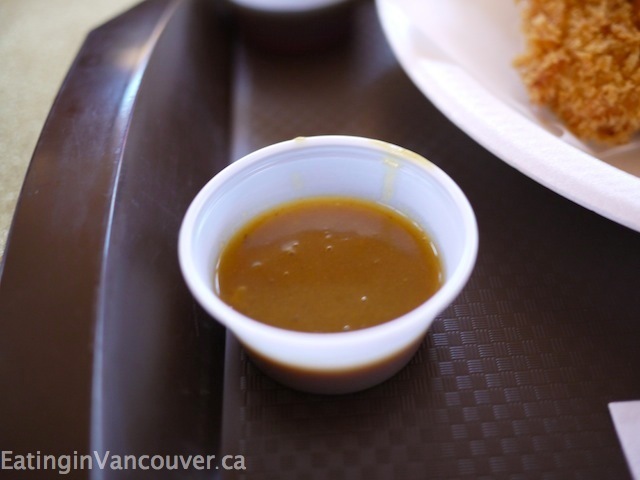 Everything is made from scratch at Richmond’s Saboten except for a few sauces, which are sent directly from Japan. 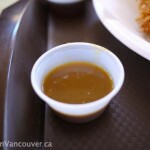 Their secret special sauce is made with fresh ingredients plus over ten different spices to bring out the pork’s ideal flavour. 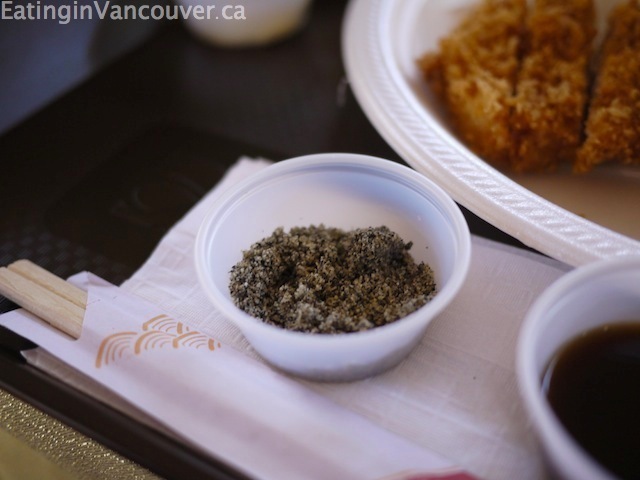 Plenty of tasty sauces were provided for dipping our tonkatsu, including curry, ponzu, tartar sauce for the shrimp, and sesame (black and white sesame seeds ground to order) as well as a tangy salad dressing to drizzle on the shredded cabbage. 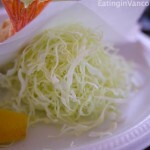 Saboten uses a special type of cabbage from California which the chef says is lighter than other cabbage varieties. Fairchild Media along with other members of the press were present to report on the event. 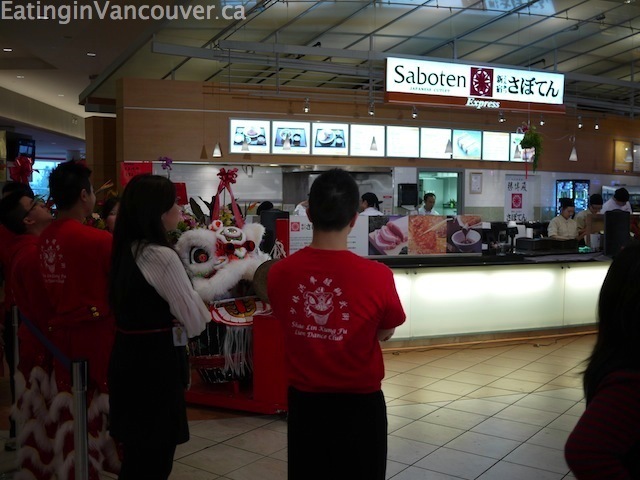 Grand opening celebrations, which coincided with Chinese New Year, included a lion dance and ribbon-cutting ceremony. 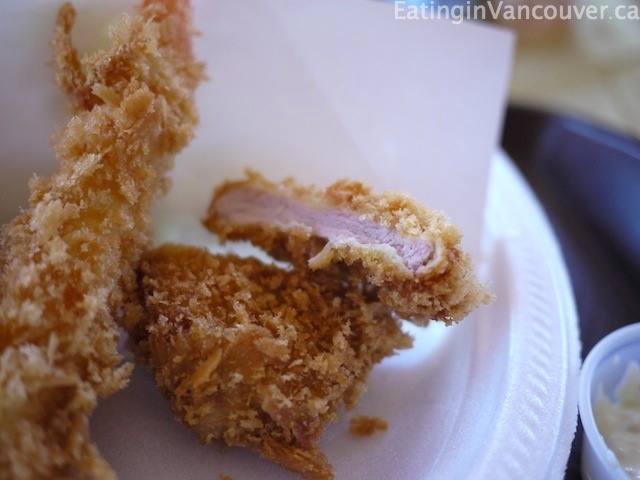 If you love pork cutlet, or “donkas” as we knew it in Korea, then you’ll want to check out this authentic Japanese tonkatsu outlet!